I feel like this site would be complete if someone just added a favicon. It would just make the site feel a bit more professional. This is not a hyperlink. asdf1 wrote: I feel like this site would be complete if someone just added a favicon. It would just make the site feel a bit more professional. We did have one, along with a nice red theme to go along with it. 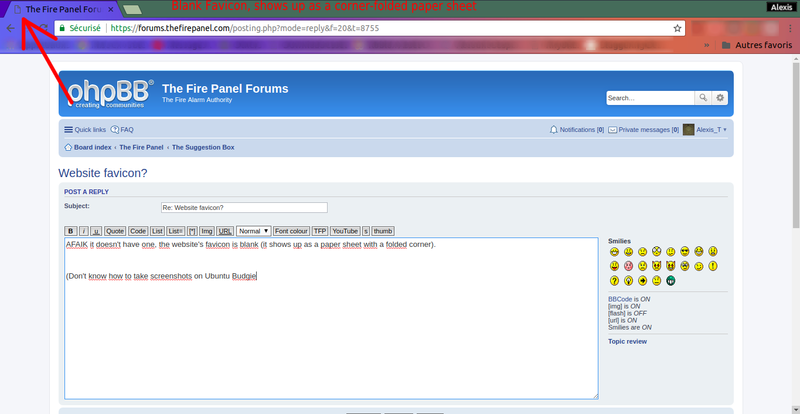 However, when they ported the forum to PHPBB3, the theme was incompatible. We've been saying this for about a year now, but we should get the theme back soon. All you need to do is add a "favicon.ico" file to the "public_html" directory of the website (or wherever the website's HTML files are stored) and the browser should automatically set that icon as the favicon. You don't need to code anything to get this to work. I'm not the server-side administrator; you'd need to take that up with either Samson or Andrew. Robert A wrote: I'm not the server-side administrator; you'd need to take that up with either Samson or Andrew. Okay. I will PM them. As far as I know, TFP does have a favicon. You should see a small image of a Fire-Lite MS-9xxx series panel displaying on your tabs and bookmarks. kcin556 wrote: As far as I know, TFP does have a favicon. You should see a small image of a Fire-Lite MS-9xxx series panel displaying on your tabs and bookmarks. No; it just shows a piece of paper with the corner folded icon. This is odd - the image below shows how the tab on my browser appears, complete with the favicon. Yeah, the custom favicon doesn't appear for me either. This is very strange, and we will have to investigate further. Opening the site with Internet Explorer shows no favicon image for me. It's possible the favicon image is still stored in my Chrome browser from using the website back before the theme was changed. I also have several bookmarks to the site showing the favicon, which could contribute to the image being stored... otherwise I have no explanation. kcin556 wrote: This is very strange, and we will have to investigate further. Well, since the favicon is usually located at http://thefirepanel.com/favicon.ico I went to this URL and got a 404 Not Found error. I have yet to check if the forum subdomain contains the favicon file. I’d wonder if it’s macOS but seeing Windows users with the error I doubt it. It’s also worth noting that Safari in most Macs does not display favicons due to its design but I use Google Chrome and get that icon. If the favicon isn't located in the public_html directory of the server, Chrome won't automatically detect it and display it.